Is there a better popcorn thriller than 1994’s Speed? Thanks to its novel premise and breakneck pacing – not to mention the chemistry between leads Keanu Reeves and Sandra Bullock – we’d argue there isn’t. Director Jan de Bont does a brilliant job of wringing every ounce of tension possible out of the concept of a bus that can’t slow down without detonating a bomb. de Bont – working from the blueprint provided by screenwriters Graham Yost and Joss Whedon – never lost sight of what makes a movie truly nail-biting: the human element. That’s why Speed isn’t just a never-ending adrenaline rush – it manages to find the time for us to actually get to know Reeves’ Jack Traven, Bullock’s Annie Porter, and the rest of the passengers on the bus. Not only does this make us care whether or not the bus is blown sky high, it also leads to some surprisingly funny moments, which provide some momentary relief from the ever-increasing stakes. It also allows for the romance between Jack and Annie to believably blossom, so much so that audiences actually buy it when the pair start making out late in proceedings. 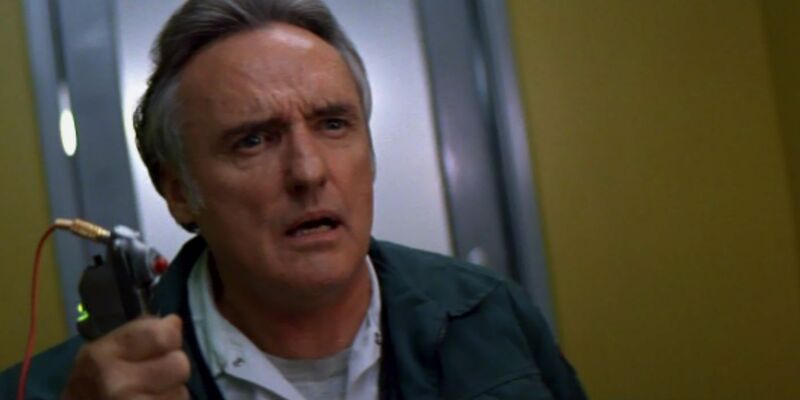 Of course, Speed wouldn’t work without a great villain, and that’s where veteran actor Dennis Hopper comes in. 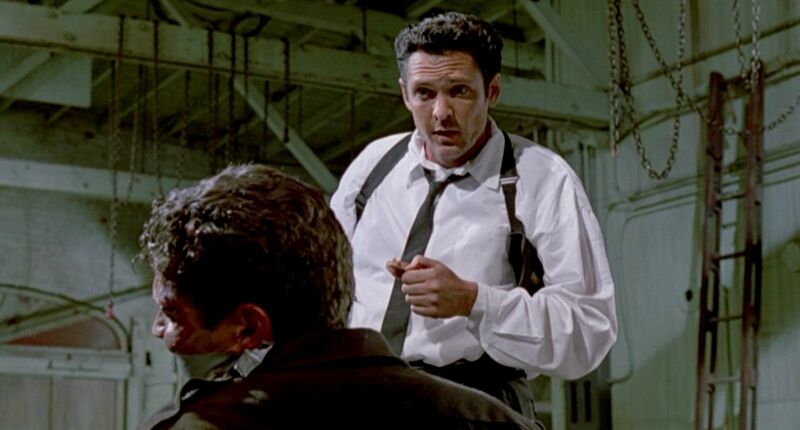 As disgruntled ex-cop Howard Payne, Hopper makes for the perfect baddie, whether he’s snarling threats or making mean-spirited jokes at his intended victims’ expense. Thanks to Hopper’s charisma, Payne is a villain you can’t help but enjoy watching – although you never stop rooting for Jack and Annie to foil his deadly scheme. 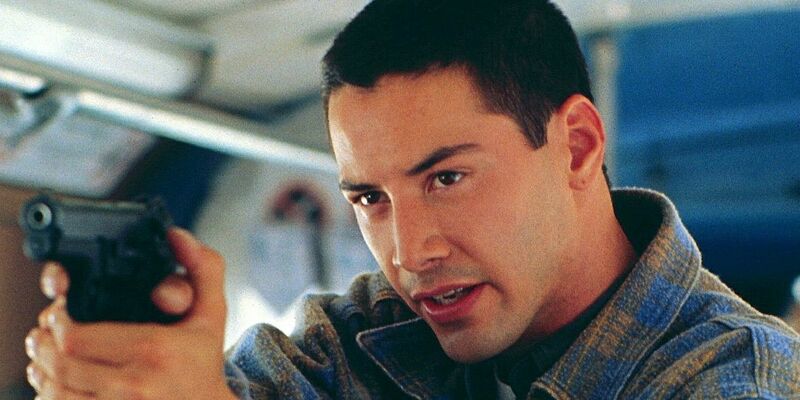 To celebrate this 90s classic, here’s 20 Crazy Details Behind The Making Of Speed. Graham Yost came up with Speed’s basic plot after a conversation with his father. Yost’s dad was talking about 1985 thriller Runaway Train, which he mistakenly recalled featuring an explosive threat. Intrigued, Yost checked out the film, and decided it would indeed have worked better if a bomb were involved and the setting shifted to a bus, instead. Thus, Speed was born, although there were still a few more details to iron out – like just how fast the bus should go. According to an interview with Empire Magazine back in 2001, Yost originally planned for the mandated top speed to be only 20mph, before a friend convinced him that 50mph would be more exciting! It’s virtually impossible to imagine anyone other than Keanu Reeves in the Jack Traven role, but the producers of Speed initially had another actor in mind. Reeves wasn’t the bankable blockbuster star he is today. The buddy cop outing Point Break was the only action movie on his resume at the time. So the studio was eager to go with someone they thought was a safer bet: Stephen Baldwin. However, Baldwin turned down the part and director Jan de Bont was free to sign Reeves, who was his preferred choice. We’ve gotta say that we’re glad this happened, as it’s hard to imagine Bullock gelling as well with Baldwin as she did with Reeves. After Speed proved to be a massive critical and commercial success, a sequel was given the official greenlight by 20th Century Fox – and they expected that both Keanu Reeves and Sandra Bullock would return. 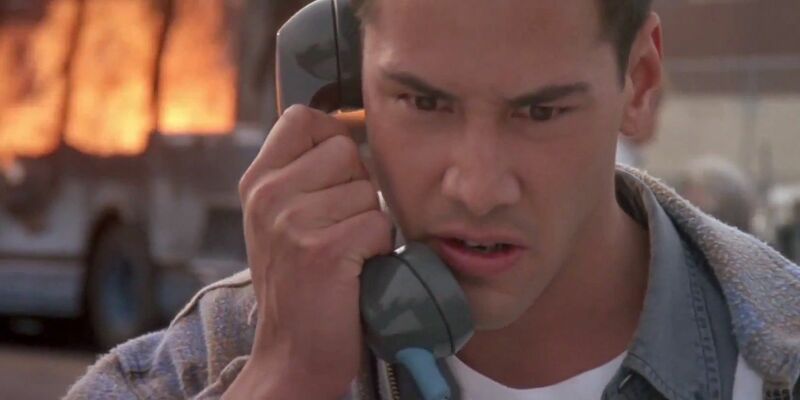 As we’ll cover later in this list, Reeves ultimately opted not to return, and Jack Traven was replaced by Jason Patric’s Alex Shaw in Speed 2: Cruise Control. Speed 2 addresses this by explaining that Jack and Annie had split up, which is why she’s now dating Alex. Funnily enough, had Reeves reprised his role, not only would Jack and Annie still be a couple, but according to buzz from the time, Speed 2 would have opened with them getting hitched! 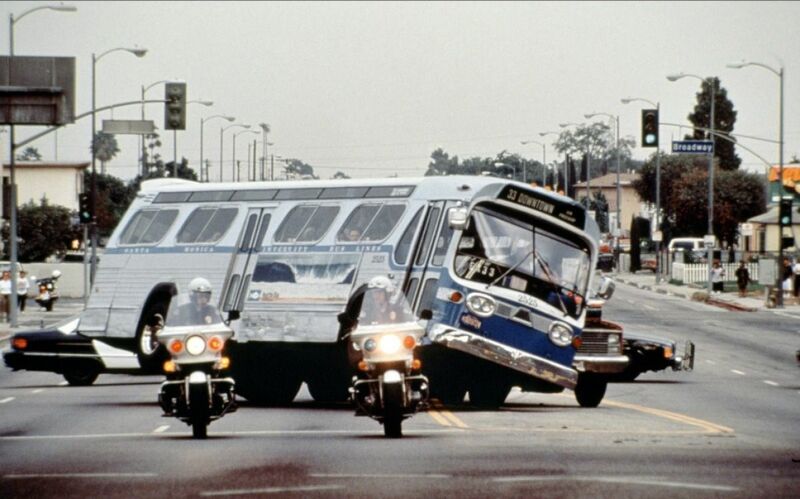 In Speed’s iconic “bus jump” scene, the titular vehicle defies audience expectations (and the laws of physics) by clearing a fifty-foot gap in the road. Now, it goes without saying that there are inherent risks involved with undertaking such a feat – even if the gap itself was added via CGI. Nevertheless, we can’t stress enough just how dangerous it was capturing this moment on camera. The crew was worried that the stunt driver performing the jump would shatter his spine upon impact. As if that weren’t enough, even if he didn’t break his back, there was a possibility the camera rig could’ve broken loose and skewered the poor guy! If it’s impossible to imagine somebody else playing Jack Traven, it’s equally inconceivable to picture anybody other than Sandra Bullock as Annie Porter. All the same, at least two other actresses were considered for the role ahead of Bullock – mostly because the character evolved constantly during pre-production. Originally, Annie was written as a no-nonsense African-American paramedic. Her experience behind the wheel of an ambulance was intended to rationalize her driving skills. Halle Berry was approached about playing the part, but she knocked it back. Then the character became a wise-cracking driver’s ed teacher, with Ellen DeGeneres the producers’ ideal choice! Finally, Annie became Jack’s love interest, making Bullock perfect for the role. Speed features more than its fair share of hair-raising stunts, and many of these were performed by Keanu Reeves himself. Reeves started out quite wary of performing these potentially life-ending feats himself – a reminder of how inexperienced he was with action films at that point in his career. However, over the course of filming, Reeves became increasingly comfortable with the stunt work – although director Jan de Bont forbade him from attempting the really risky stuff. One of the forbidden stunts was the moment when Jack leaps from a speeding Jaguar onto the bus. Undeterred, Reeves rehearsed in secret, and was able to undertake the stunt himself when it came time to shoot the scene. We’ve praised Speed for its admirable amount of character development– by the standards of the action/thriller genre, at any rate. At the end of the day, the movie is still a fast-paced blockbuster, and director Jan de Bont rightly keeps the focus squarely on the action. This means that certain quieter scenes had to be excised, including pretty much all of Annie’s backstory. It turns out our leading lady once harbored aspirations of making it as an artist which never came to fruition. Would this have fleshed out Annie’s character more? Without doubt. But Bullock has already won audiences over by this point, earning this moment its place on the cutting room floor. Who doesn’t love stories of actors going all method in their preparation for a role – especially when this constitutes learning skills they don’t strictly need to do their job> Take Sandra Bullock’s research for Speed – the Oscar-winning star actually learned how to drive a bus (even passing a driving test) to convincingly portray Annie! Was it necessary for Bullock to become a fully qualified bus driver to star in the film? Probably not – the actress does little, if any, of her own driving on screen (an unseen stunt driver handled this). Nevertheless, the knowledge informs how Bullock behaves behind the wheel, lending her scenes authenticity, which is always a good thing. Let’s look again at Speed 2: Cruise Control— namely, exactly why Keanu Reeves decided not to appear as Jack Traven for the second go-round. It’s actually pretty simple: he was given a copy of the script, and what he read didn’t grab him. 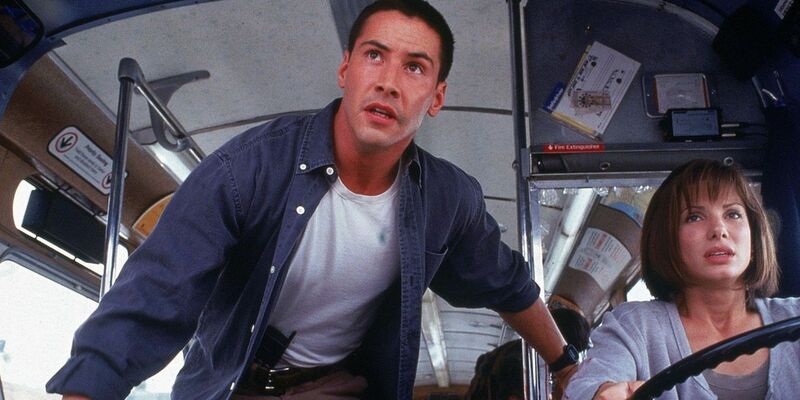 Reeves’ main complaint is a common one about Speed 2– that a runaway boat is slower than the bus featured in the first movie. It’s a shame, too, as comments by Reeves indicate he would have signed-on, had the script been up to snuff. He had enjoyed working with director Jan de Bont and became good friends with co-star Sandra Bullock, he just couldn’t commit to Speed 2’s story. Studio executives are a notoriously conservative bunch, so when Keanu Reeves adopted a new hairstyle ahead of filming on Speed, they kinda freaked out. See, when Reeves signed on, he was still rocking the long locks he sported in films like Point Break and Bill & Ted. 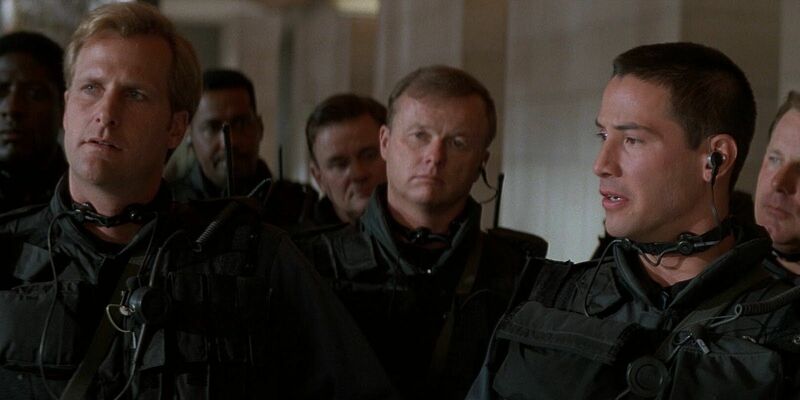 Director Jan de Bont didn’t think this was the right haircut for a cop like Jack, and Reeves agreed – shaving his head almost down to the scalp! 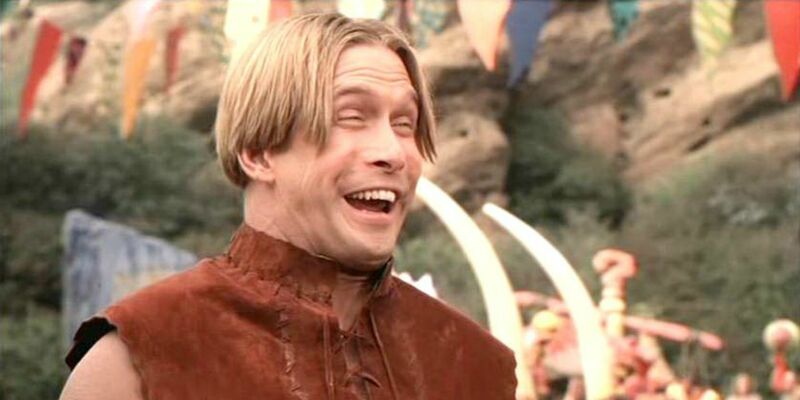 The powers that be at 20th Century Fox objected to Reeves’ new ‘do, but they needn’t have worried. By the time filming commenced, the star’s hair had grown in, and not only did he look the part, he looked good, too. 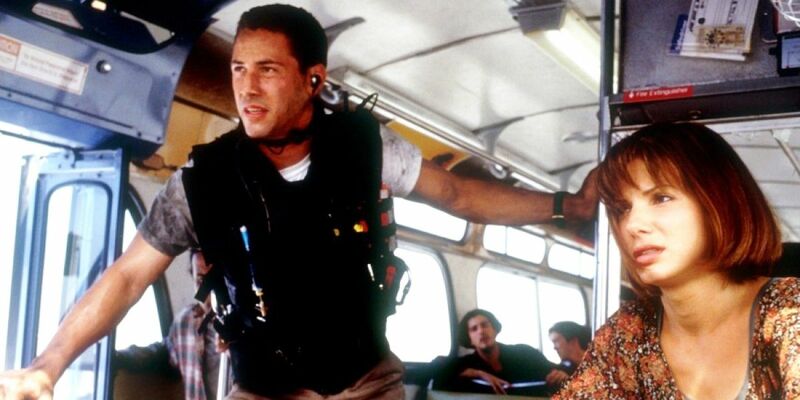 The vast majority of Speed’s runtime takes place on a bus, however the action shifts to a hijacked subway train in the third act. Unlike the earlier scenes – which used actual buses wherever possible – here, the filmmakers relied on a gigantic model train to achieve the required exterior shots. When all of its carriages were placed on the scales, this puppy clocked in at 150lbs! This wonderful toy didn’t survive the shoot, though – it was (intentionally) derailed into a miniature construction site, as part of the movie’s grand finale. An overlooked aspect of Speed is just how great its title is. In one word, the filmmakers perfectly encapsulate the core concept of the movie, as well as its lean, streamlined storytelling sensibilities. The film’s name was set in stone fairly early on in the scripting process, although screenwriter Graham Yost nearly went with a slightly different – and far less awesome – title, instead. So the story goes, Yost initially christened his screenplay Minimum Speed, before shortening it to plain old Speed. He quickly decided that the word “minimum” has less than flattering connotations, which is why he dropped it. We’re glad he did, as Minimum Speed also suggests a much slower kind of thriller! A young Joss Whedon had a significant impact on the Speed screenplay. Would you believe he wrote virtually all the dialogue? That’s no exaggeration, either: credited screenwriter Graham Yost estimates that Whedon wrote “98.9%” of the words spoken by characters in the film. Yost has explained that this is because Whedon was more talented in the dialogue department than he was, and openly admits that many of the film’s most memorable lines belong to Whedon. When Howard Payne barks “Pop quiz, hotshot” at Jack, the line was all Whedon. It’s an example of him taking Yost’s serviceable dialogue and making it punchier, wittier and, frankly, a whole lot more fun. It’s not that unusual for filmmakers to add new scenes just prior to the start of principal photography – but amazingly, Speed’s most iconic scene wasn’t scripted until the eleventh hour! 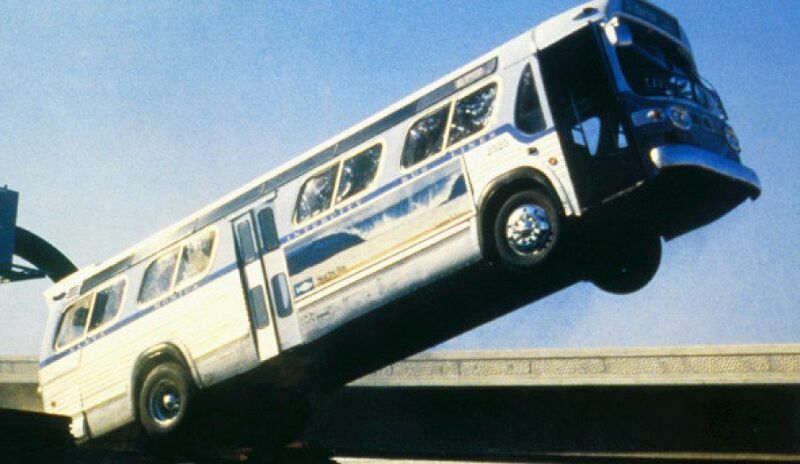 We’re talking about the “bus jump” scene, which director Jan de Bont only devised during location scouting, after spotting a gaping void in the under construction Judge Harry Pregerson Interchange. de Bont immediately requested that screenwriter Graham Yost draft a set piece where the bus is forced to jump over an unfinished section of highway, and the writer enthusiastically complied. Yost is the first to admit the “bus jump” wouldn’t work in real life – but he rightly argues that it’s the spectacle that matters here. Acclaimed auteur Quentin Tarantino has a relatively short filmography – by the director’s own reckoning, he’s only overseen eight features to date. Intriguingly, this number could have been one higher, had the Speed producers’ plans to hire him to helm the film panned out. Following the release of celebrated crime caper Reservoir Dogs in 1992, Tarantino was one of the most sought after directors in Hollywood, and Speed was one of the many projects that landed on his desk. Tarantino passed on the gig – opting to work on his next masterpiece, Pulp Fiction, instead. This paved the way for cinematographer Jan de Bont to make his directorial debut on the movie. As Howard Payne, distinguished actor Dennis Hopper is the consummate blockbuster movie villain. He’s smart, scary and funny in equal measure – and Speed wouldn’t be the same without him. But that’s nearly how things went down, as Jack’s boss, Harry Temple, was originally set to be the flick’s main antagonist. This wasn’t altered until very late in the game – literally only months before cameras rolled! 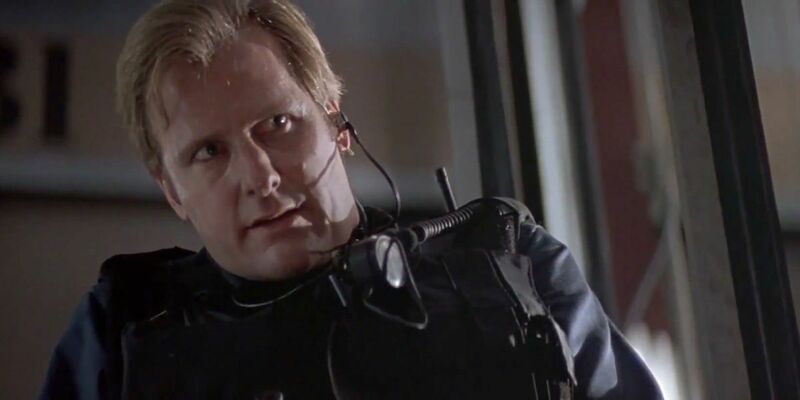 It was at this point that screenwriter Graham Yost decided that the reveal that Temple (played by Jeff Daniels) was the bad guy felt like a cheap twist. He subsequently elevated Payne – only an accomplice until now – to the role of big bad, and Hopper made the most of it. We’ve previously mentioned how much of the dialogue in Speed was added by Joss Whedon, but it’s also worth mentioning the material he removed, as well. Why? Because prior to Whedon coming onboard, Jack Traven was written as a typical action hero, complete with a penchant for witty one-liners. Whedon and Reeves both felt this didn’t suit the character. 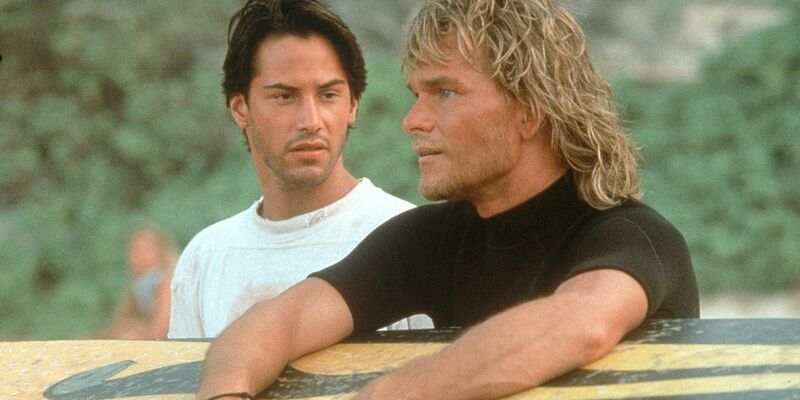 Reeves was able to draw upon his experiences with real life police officers during the making of Point Break. Together, the duo reworked Jack’s personality, retooling him as a more sincere figure with a keen appreciation for the value of the human lives under his protection. It’s common for movies that test poorly with preview audiences to have their release dates pushed back, in order to allow the filmmakers time to rework the film, in the hopes of improving it. What’s not so common is for a flick to test so well that its opening is bumped forward in time – but that’s exactly what happened with Speed! According to screenwriter Graham Yost, when 20th Century Fox witnessed the incredible reception Speed received at test screenings, the studio suspected it had a hit on its hands. The premiere date was promptly rescheduled for June instead of August, which paid off – Speed debuted at number one, raking in $14.5 million its first weekend. Part of the appeal of Speed is that – aside from the winning combination of leads Jack and Annie – the supporting cast of bus passengers are a largely relatable bunch who are easy to root for. 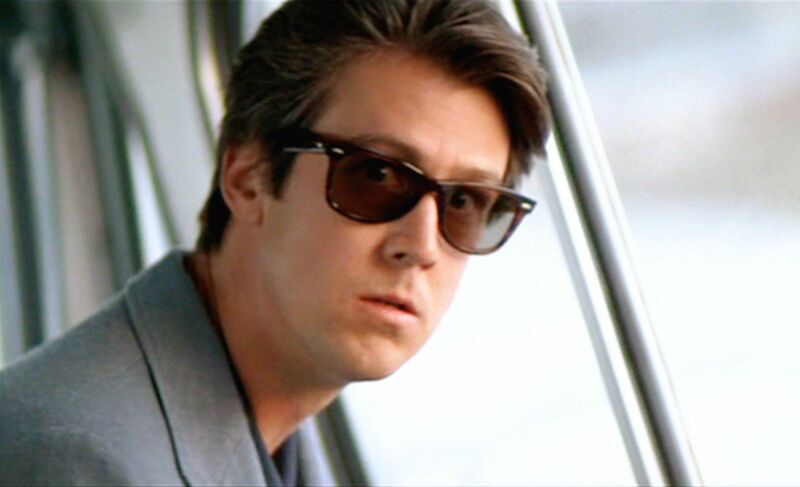 Yet one of their number was nearly a much less likeable soul: Doug Stephens, the wide-eyed tourist played by Alan Ruck. Another example of the magic uncredited screenwriter Joss Whedon worked on Speed, Doug was given a drastic overhaul shortly before filming. Originally, he was written as an abrasive lawyer, who didn’t make it out of the ordeal on the bus alive. Whedon felt audiences would respond better to a more sympathetic character, making Doug a naive out-of-towner, instead. It’s no secret that Oscar-nominated screenwriter Joss Whedon served as an uncredited screenwriter on Speed. 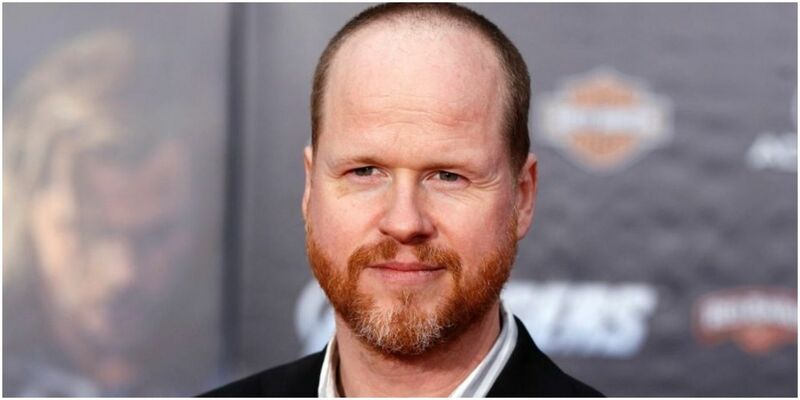 Everyone involved – including the movie’s sole listed screenwriter, Graham Yost – has acknowledged just how vital Whedon’s contributions were to the finished script. What isn’t so well known is that another, unnamed scribe was brought in to polish Yost’s screenplay prior to Whedon – and according to Yost, they didn’t exactly do a great job. Indeed, he has since branded the anonymous screenwriter’s work as “terrible,” and claims he needed three whole days to remedy the damage done to his original draft. Know of any other crazy details behind the making of Speed? Let us know in the comments!